Maybe its just me being pregnant but this last week has been really HOT! Fortunately our sweaty little boy has his ways of cooling off in this sweltering heat. Here he is enjoying a cool swim in the nice pool at Ah-Mah's place....and it looks like he's not the only one enjoying the swim! And when he's stuck at home with me, we sometimes take a quick trip down to the Jacob Ballas Garden in the afternoon to cool off in the lush greenery of our favourite park! 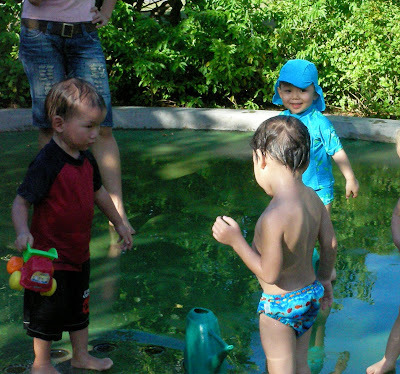 It's also a great place to celebrate the wonders of water play with other kids as well -- and that certainly takes all our minds off the hot weather!